In the case of the UCW, Lee explains that when coming east from Salt Lake, his railroad had planned to hook up with the Denver and Salt Lake in Craig, Colorado, but the D&RGW had beaten him to the punch. Consequently, he chose a more northerly route around Craig and down into Denver. The rationale and backstory are what enthused Lee and his team when planning the layout. He continues that the other roads with which he interchanges – the D&RGW, the WP and SP – are all competitors of his, and fighting for their cut of traffic revenue. On the UCW, Denver and Salt Lake City are not modeled, but are represented by hidden storage. 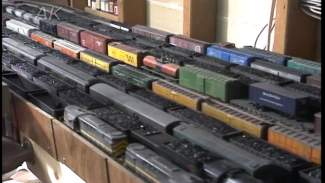 And in the age-old tradition of never finishing a layout, just a year and a half ago Lee tore out about 75% of his layout – mainly in storage, to create an active staging area to keep his Yard operator busier during ops sessions. It’s a great example of how even mature, complete layouts can undergo major changes to improve processes and practices, as well as introduce new or improved technology. Don’t be afraid to try it! 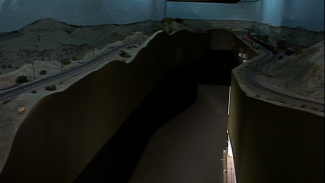 Here are more tips on model railroad layout design. No video, just sound. All white. We are sorry that you are not able to view the videos. We have tested them successfully. We have send you an email with some troubleshooting tips. If you are still not able to view the videos, please give our Customer Service team a call at 1-855-208-7399 and they will assist you over the phone.